This is an animated gif of actor / comedian Bill Cosby waving a magical hot dog around in the air. The actor is most famous for his leading role on The Cosby Show, which ran between 1984 and 1992. I have no idea why he's holding a hot dog in his hands. This is an animated gif of former US President George Bush laughing before turning around to the camera and giving the middle finger / flipping the bird. This was before the cameras had gone live. I also believe that this was a number of years before he became president. 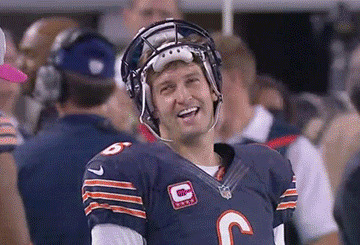 This is an animated reaction gif of Jay Cutler laughing. Cutler is an American football quarterback for the Chicago Bears, which are a team in the NFL. He is from Columbus, Georgia. This is an animated gif of actor Marlon Brando rolling his eyes before smiling bashfully. This is typically used as a reaction gif whenever somebody receives a compliment on the Internet. This is animated gif of Les Grossman from Tropic Thunder (2008) dancing. Grossman was portrayed by actor Tom Cruise. 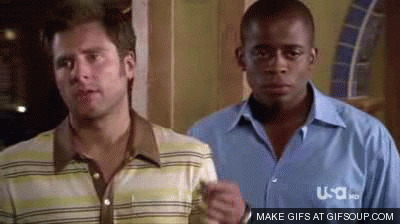 This is an animated gif from the TV series Psych, in which Burton "Gus" Guster tells Shawn Spencer to "hit the Jackal switch". Shawn: It looks like its stealth mode for us partner. Shawn flicks imaginary switch with finger. Ok, firstly let me preface this by saying that I have no idea where this is from. This is an animated gif of a man pushing out his false teeth before holding a lighter up and setting his beard on fire. Just in case you were wondering, he quickly put it out afterwards with his hand. This is an animated gif of John Cleese in the Monty Python sketch "The Ministry of Silly Walks", which first aired back in 1970. In the sketch, Cleese was a government employee who developed silly walks via grants. 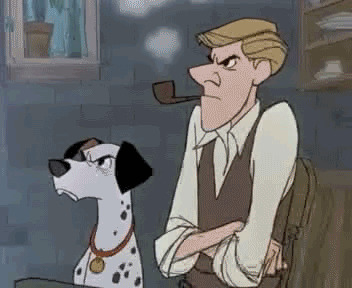 This is an animated gif of Roger Radcliffe from 101 Dalmatians (1961) smoking a pipe with an angry scowl on his face. Hard to believe that this movie is 50+ years old. This is an animated gif of the Fight Club (1999) monologue where Edward Norton says "Everything is a copy of a copy". This is often used as a reaction gif on websites where content is often reposted multiple times. This is an animated reaction gif of Don Draper looking rather sad and crying. Draper is the main character in the TV series Mad Men, which premiered back in May, 2007. The character is portrayed by actor Jon Hamm. This is an animated gif of the cartoon character of Mr. T crying. I'm pretty sure that this is from the Mister T series, which ran on NBC between 1983 and 1986. This is an animated gif of an Asian kid wearing a navy blue suit putting his foot up before cooly taking off his sunglasses. I'm not sure where this gif is from, so if you know, please post a comment in the comment section below. This is an animated gif of an Ukrainian football / soccer fan dancing during the France vs Ukraine match at Euro 2012. This is an animated reaction gif of the Fresh Prince of Bel Air, Will Smith crying in a rather dramatic fashion. The show ran between 1990–1996, which is kind of odd because you wouldn't expect such a popular show to end after 6 years. Maybe Will was ready to move onto bigger and brighter things? This is an animated reaction gif of Colin Farrell with a WTF facial expression. Colin is an Irish actor from Dublin, Ireland. He recently starred in the movie Seven Psychopaths. 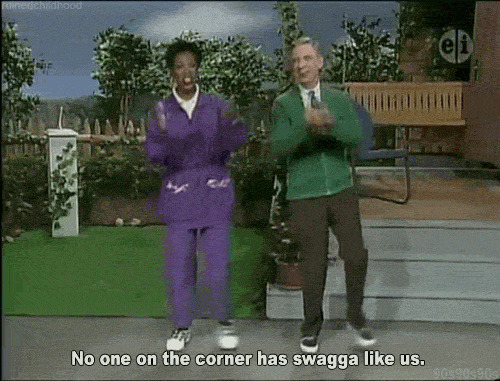 This is an animated gif of Mr Rogers dancing with a black woman while the text "No one on the corner has swagga like us" is layered over it. Fred McFeely Rogers was the main character in the children's TV show Mister Rogers' Neighborhood. 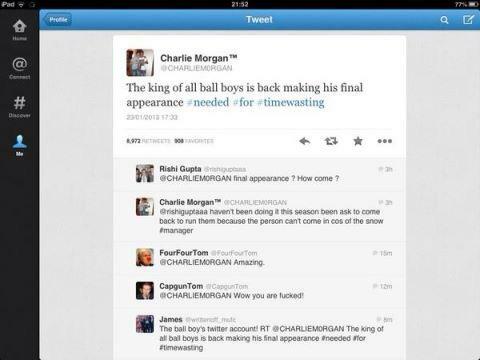 He later deleted the tweet in question. This is an animated gif of Dwight Schrute smiling / grinning through the blinds in his office. Dwight is a character in the TV show The Office. He's portrayed by actor Rainn Wilson. This is an animated gif of Ogre from Revenge of the Nerds (1984) angrily shouting Nerds. "The Ogre's" real name was Frederick W. Palowaski, who was portrayed by actor Donald Gibb. This is an animated gif of Earl Sneed Sinclair from the TV show Dinosaurs dropping a soda can in shock. The TV show Dinosaurs ran between April, 1991 and July, 1994. Earl was voiced by actor Stuart Pankin. This is an animated gif of Atticus Murphy Jr. drinking a cup of coffee before casually punching a lady as she runs by him in the hallway. This is from "Todd and the Book of Pure Evil" (2010). This is an animated gif of an Asian man crying. Not sure where this is from, but there are literally streams of tears coming out right of his eyes. This is an animated gif of Wayne Campbell's shirt ripping off. Campbell was a character in the movie Wayne's World (1992). He was played by actor Mike Myers. This is an animated reaction gif of Lucille Bluth closing over a door while looking unamused and unimpressed. Lucille is a character on the TV show Arrested Development. She is played by actress Jessica Walter. This is an animated gif of a long-haired guy jumping out of his seat in surprise, sending chips / crisps flying everywhere. This is how I feel whenever I've left something on in the oven. This is an animated reaction gif of Paul Bearer looking shocked and surprised. Bearer is a character / wresting manager in the WWE. His real name is William Alvin "Bill" Moody. He's from Mobile, Alabama. This is an animated gif of Jillian Bell suddenly appearing from around the corner. Jillian is a character from the hit TV show Workaholics. I remember seeing this with the title "My face when I overhear somebody speaking about a TV show that I like." Brennan Huff: Did we just become best friends?! This is often used whenever somebody finds another person that shares a unique interest. This is an animated gif of Théoden from Lord of the Rings: The Two Towers saying "You have no power here!" This was while he was was possessed by Saruman. This is an animated reaction gif of Danish actor Dirch Passer looking shocked and afraid at what he sees. Passer starred in 90 movies. Sadly, he passed away in 1980 at the age of 54. This is an adorable reaction gif of a small baby pulling a sad face. This is often used when... uh... a person is feeling down about something, I guess. This is an animated gif of Gaius Baltar furiously mashing away / hitting at the keyboard of his computer. Baltar is a character in the TV show Battlestar Galactica. He is portrayed by James Callis, who is from London in the United Kingdom. This is often used as a reaction gif whenever they've heard bad news on the Internet. 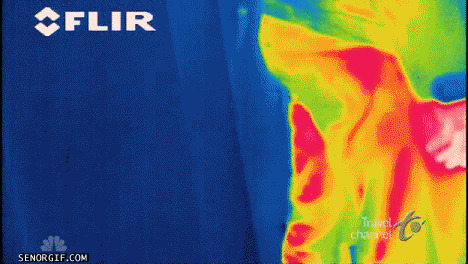 This is an image of a fart being caught on a thermal / infrared FLIR camera. Can't believe that the 100th submission on this blog this year is a gif of somebody farting. This is an animated reaction gif of a black woman looking extremely confused about what somebody has just said. This is probably the best "WTF" reaction face that I've seen in a while. Not sure who she is what this scene is from. Probably some sort of reality TV show. 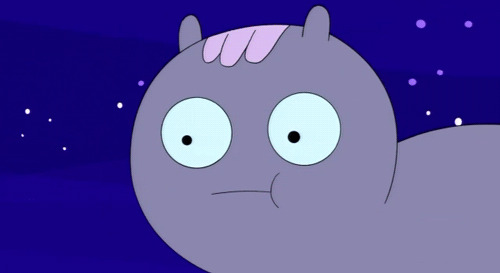 This is an animated reaction gif of the horse from Adventure Time looking so afraid / shocked with fear that his pupils start to widen. This is an animated reaction gif of actor Tommy Lee Jones looking extremely unamused at an award ceremony. Tommy is from Terrell Hills in Texas. This is an animated gif of a baby reacting to a firework that has just been let off in front of him. The poor little guy didn't know what the hell was going on. I saw this one on Reddit with the title: "When my already tall gf gets out of the car wearing 6 inch platforms." This is an animated reaction gif of Canadian actor Ryan Reynolds looking around with an extremely confused facial expression. This can be used whenever you want to express your state of confusion whenever somebody says or does something that is remarkably stupid. This is an animated reaction gif of Stephen Colbert and Jon Stewart standing together on a street drinking / sipping tea while cheering "Wow!" and "Bravo!". Both comedians are well-known for their political comedy and satire shows. This is an animated gif of Star Wars villain Darth Vader looking up at the sky and shouting "NO!" This is typically used as a reaction gif whenever something mildly inconveniences somebody.